The guides, particularly Evan, but also Chris and McKenna, were extraordinarily kind, caring, entertaining, helpful and just inspiring. They were memorable and key parts of our experience! Even the pelting rain that greeted us as we boarded our raft didn't drown our spirit. The undaunted courage and fierce energy of Evan boosted everyone's morale, and off we went. It turned out to be just a wonderful jaunt, terrific for our family group of 11, and more than we might even have hoped in bonding and enjoyment. Wonderfully planned and executed event! I loved the Hummer ride as well. Great guide, endless amusement. The peak of the experience for our group was when Chris took us away from the river , brought us into the desert silence, and just gave us a few minutes to immerse in that. It was downright spiritual. Thank you! 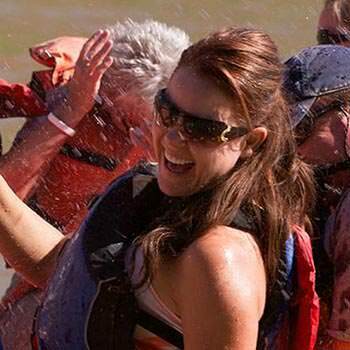 I absolutely loved my whole experience with rafting. All day rafting is the way to do it. Guides were amazing, friendly and very helpful. Lunch was served at Red Rocks Cliff Lodge, which tasted like "heaven" and the views were simply amazing…I will be back. I will choose Moab Adventure Center again….Thank you for an amazing time. I made my reservation on the phone. I was a little nervous as I have never done any rafting before. The reservationist was very helpful and reassuring that the Colorado River AM Half Day Rafting Trip was a great beginners trip. He was right! Our guide, Mickell, was great. She knew the history as well as the fun stories (Blender the Dog!) of the area. She was very warm and funny. She did a great job of bringing a bunch of strangers together so we all felt like old friends when we left. She was also great at pointing out interesting spots! (The rock that looks like a gummy bear!) Arches National Park was what brought us to Moab, but this trip was definitely the high point of our stay. We hope to come back and next time do the Full Day Rafting Trip – maybe even bring our kids. We were thinking about renting a 4 wheel drive vehicle, but we are so glad we took the tour! Rex was a terrific guide. I'm sure we saw much more than we would have on our own. We would definitely recommend the Hummer Slickrock Safari!